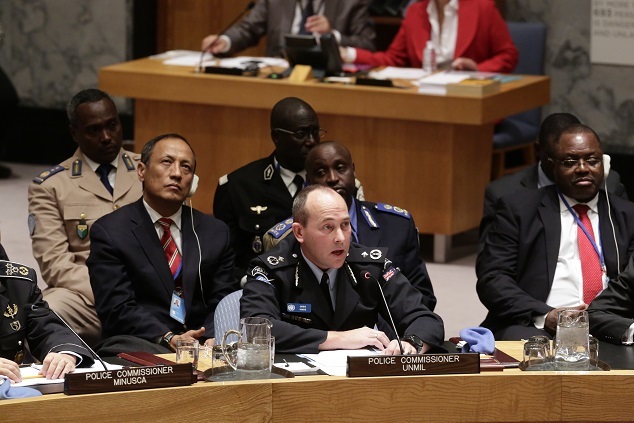 Last week the UN Security Council adopted its first resolution focused on policing issues. Foreign Minister Julie Bishop presided over the meeting as part of Australia’s presidency of the Council for November and declared the meeting and adoption of resolution 2185 ‘landmark steps’. It wasn’t an overstatement. Police peacekeepers perform critical roles in assisting host states to reform policing and law enforcement institutions. Those efforts are essential to establishing the rule of law in post-conflict societies and supporting the eventual transition and drawdown of the mission. The number of police peacekeepers has grown significantly over the last two decades (previously outlined here). Of the 103,952 uniformed personnel deployed to peacekeeping missions as of October 2014 (PDF), nearly 12% (12,331) are police. The role of police peacekeepers has evolved and expanded as peacekeeping missions have become multidimensional, but political discussions in New York have taken some time to catch up. Field views from serving police are rarely heard by the Council in New York. That’s why it was important that the heads of police components were present to exchange views with the Council. It was an idea that emerged during the 2013 Finnish Security Council retreat (PDF), modelled on annual meetings that the Council had with heads of military components. While sections of the Secretary-General’s written reports on peacekeeping missions routinely include elements on policing and security-sector reform, police commissioners aren’t generally called upon to brief the Council (unlike the civilian special representatives or force commanders). Given the Council’s role mandating police components in peacekeeping missions, hearing directly from police commissioners and asking them questions is valuable. The Council expressed its intent to hold similar meetings on an annual basis. It’s a welcome move. The views expressed by the police commissioners reinforced many of the issues identified in the resolution. The police commissioner of the UN Mission in South Sudan told the Council that police contributors needed to look more closely at guidance and training prior to deployment. The assumptions that exist in a domestic policing context may not exist in a post-conflict one, as the UN policy (PDF) on police in peacekeeping and special political missions acknowledges. Policing cultures and approaches differ significantly between countries. With 91 countries contributing police to 13 peacekeeping operations and four special political missions, formulating a coherent and consistent approach is a challenge. Resolution 2185 (PDF) attempts to address that and other systemic challenges. It requests the Secretary-General promote system-wide coherence and professionalism in policing work through the development of standards, guidance, training and evaluation processes. It also calls for mission-strategic planning processes to consider security-sector reform needs in the host country. Combined with other aspects, the resolution may ensure a greater degree of Council focus, direction and accountability when it comes to planning and mandating policing aspects of peacekeeping missions. The resolution also recognises the important role of police when it comes to protection of civilians and preventing and responding to violence against women, and encourages countries to increase female police participation in peacekeeping. It identifies the need to respond to the complex and challenging threat environments to which police peacekeepers are being deployed. That includes sharing information with counter-terrorism entities, developing expertise on the implementation of sanctions regimes, and capacity-building efforts to address illicit small arms and light weapons. Such a comprehensive approach is essential to ensuring sustainable capacity-building within the local security sector. 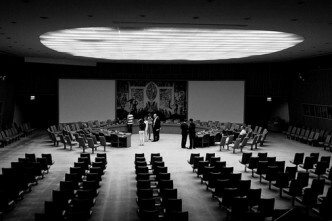 Australia didn’t only influence the content of the resolution, but also the discussions at the Council table. In addition to Bishop, one of the briefers during the meeting was Greg Hinds, an Australian Federal Police officer serving as the Police Commissioner for the UN Mission in Liberia. It’s a senior post, providing valuable operational experience in a UN mission. But with the AFP’s departure from South Sudan earlier this year, Hinds is one of only 16 AFP personnel serving in UN peacekeeping missions (the other personnel are deployed to Cyprus). 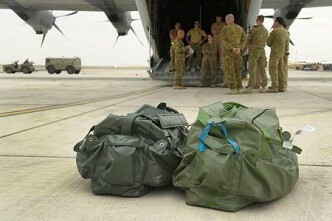 As Bishop noted in her remarks to the Council, ‘Australia has invested heavily in international police peacekeeping’. The AFP continues to do so in our immediate region, but our engagement in UN missions globally is limited. At the same time, the threats UN police peacekeepers are required to confront—terrorism and transnational organised crime—are increasingly global in nature. The adoption of resolution 2185 on policing is a milestone achievement. It’ll be a legacy of Australia’s Council term and will build on efforts to improve the overall effectiveness of police in peacekeeping. It’s also timely given the current strategic review of peacekeeping operations and special political missions. But like all resolutions, its success will ultimately depend on implementation. Ongoing engagement by experienced police-contributing countries, such as Australia, will be important to those efforts. Lisa Sharland is an analyst at ASPI. Image courtesy of United Nations.